Signed as a free agent on May 7, 2018. Ambles signed with the Toronto Argonauts on May 16, 2016, and was released from the team’s practice roster on Aug. 7, 2016. 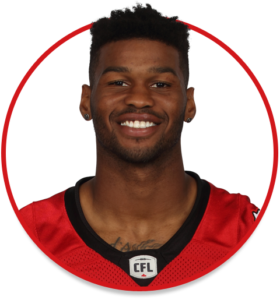 (Calgary) Ambles was on the Stamps’ practice roster until being activated in September. He started six regular-season games and made 28 catches for 306 yards and four touchdowns. His first major came in a Week 18 contest against BC, which started a streak of four consecutive games with a touchdown. He had season bests in Week 19 against Saskatchewan with eight receptions for 84 yards. Ambles started the Western Final and made three receptions for 41 yards. (Toronto) Ambles signed with the Argos in May and was on the practice roster until being released on Aug. 7. Ambles spent two seasons (2013-14) at Houston. In 23 games including 12 starts for the Cougars, he had 49 receptions for 791 yards and five touchdowns. Prior to attending Houston, he played one season at Arizona Western and one season at Southern California. Ambles received all-state honours as a junior at Henry County High School and was named to the 2010 US Army All-American Bowl as a senior. He majored in health at Houston.